Thousand Oaks, CA—February 2019… Harbinger Pro Audio, makers of versatile, powerful, and affordable live sound equipment, are pleased to announce the LP7800 Powered Mixer. Sporting a classic “P.A. head” form factor, it provides bands, choirs, schools, rehearsal rooms, and small to medium-sized performance venues with everything needed to sound stellar, time after time. Every input channel has its own three-band EQ, monitor send, and effects send. High-quality digital effects run the gamut from reverbs and delays to chorus and flanger—and even a vintage rotary speaker simulation. The Variant knob quickly fine-tunes key effects parameters to taste, and an effects-to-monitor send adjusts the intensity of effects heard in the monitors. Effects can be toggled on and off with a footswitch, which is often desirable when the singer in a band also performs emcee duties at an event. The LP7800’s rugged construction, including corner protectors and heavy-duty vinyl covering, ensures every unit will sound and look great for years to come. Five-segment LED meters on both output sections let users know at a glance if the LP7800 is working too hard—or not hard enough. 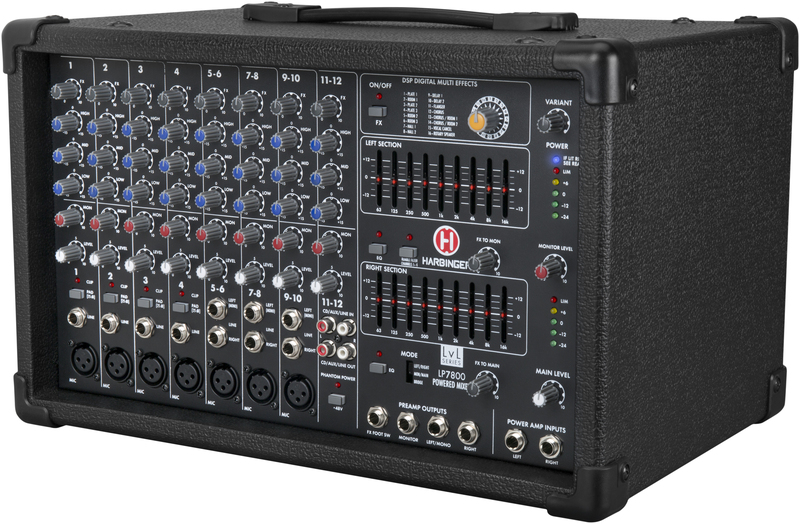 The Harbinger LP7800 powered mixer will be available at Guitar Center stores and MusiciansFriend.com in February 2019, at a street price of $399.99. To learn more about Harbinger’s line of live mixers, speakers, and turnkey P.A. system solutions, visit www.harbingerproaudio.com .